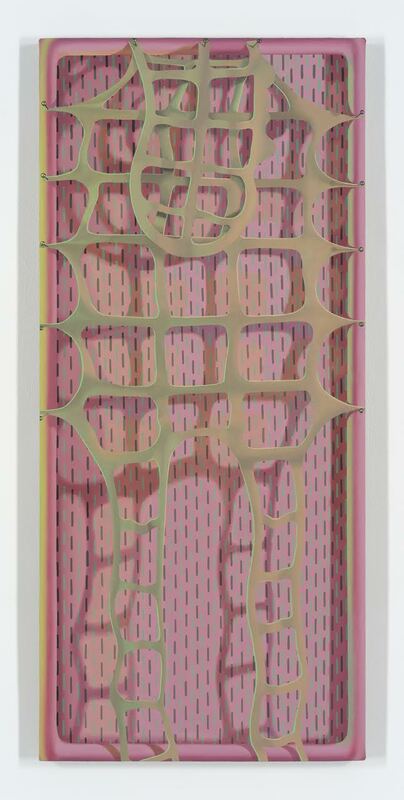 Sascha Braunig, Hide, 2015, oil on linen over panel, 42 3⁄4 × 19 inches (108.59 × 48.26 cm). Courtesy of the artist and Foxy Production, New York. Image courtesy the artist and Foxy Production, New York. Contributed by Rob Kaiser-Schatzlein / Sascha Braunig, whose solo show “Shivers,” is on view at MoMA PS1 through March 5, recently returned to New York City from Portland, Maine, to participate in the Sharpe Walentas Studio Program. 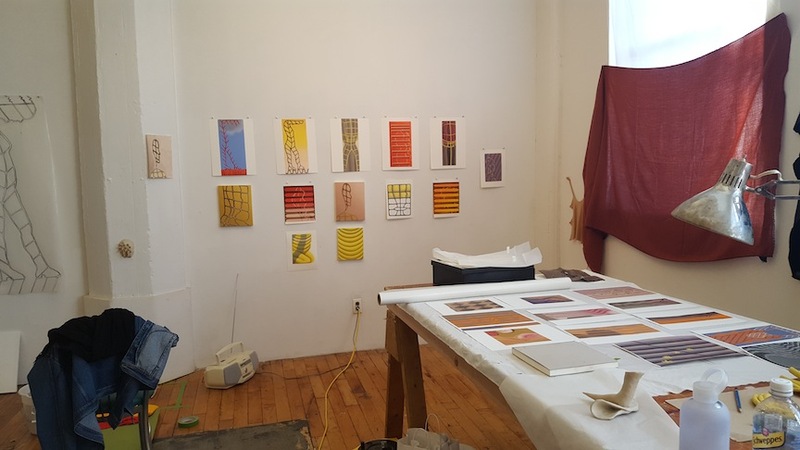 When I stopped by her new space, we discussed her process and the changes that have taken place in her practice over the past five years. 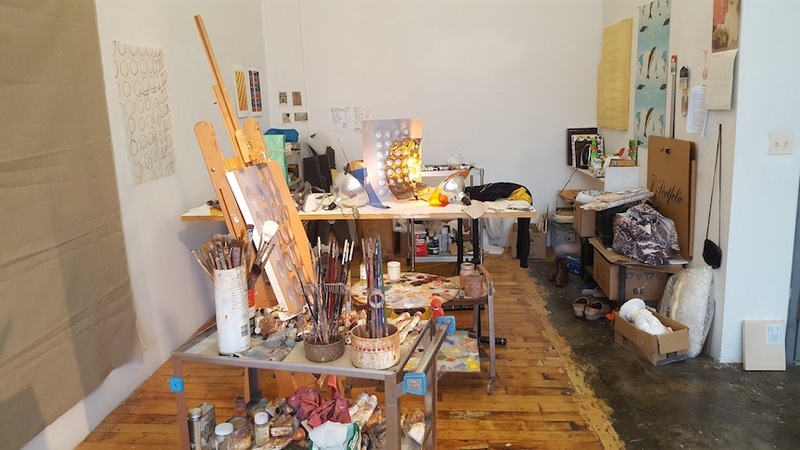 Braunig’s studio at Sharpe Walentas Studio Program, 2016. Small oils and glassine studies line the studio walls; across the room an easel, paint cart, and still life sit in an intimate, coiled arrangement. Her work is tight and lapidary, so I was surprised to learn that she is not an academically trained painter–though perhaps I shouldn’t be because academic credentials seem increasingly rare among the most technically thrilling painters today. She told me she is after a “palpable sense of volume and fleshiness,” which is likely the impetus for her rigorous paint handling. The dual lifelike and lifelessness of her sculptural models and disconcerting odd-angled lighting (more precisely, Roberta Smith notes that the paintings “seem lighted by a monitor’s glow”) make a room full of her work feel haunting. She taps into the subtle but primal fear of non-human human-seeming things such as portrait paintings, mannequins, and artificial intelligence. The unexpected empathy we feel for the figures gives her tense, turning, and drooping forms their spine-twisting resonance. Rob Kaiser-Schatzlein: I’m curious how you felt when you saw five years worth of work all together at MoMAPS1. Sascha Braunig: At first, I felt totally panicked and overwhelmed, but that was partly because I’ve never had the experience of seeing all this work together before. The show seemed like a time capsule, compressed time. It represents so many hundreds of hours of work. I remember the time I spent in front of each of these paintings, what was going in my life or what I was listening to. It’s a strange feeling, and I freaked out a little bit, and we had to send everyone out of the room at one point. Ultimately, it’s wonderful, and I’m happy. It feels like a punctuation. RKS: What have you noticed that has changed? SB: The paintings get technically better and more precise, for sure. Some of the earlier ones look clunky to me, but I don’t dislike that. In fact I’m not into the precision as much. I want to reintroduce the excitement of not knowing how to make them. Right now I am experimenting with working more like I did in the beginning, making an elaborate model that I then paint from. I hadn’t necessarily been doing that for the recent paintings. Recently I would make only a partial model or a really scaled down version or I would highly stylize what I was looking at. But I wanted to start looking really closely at an object again to see what would happen, to see if that would reintroduce the excitement of figuring things out. Not that I haven’t been figuring things out, but it has been limited to composition and trying to throw the figures around. 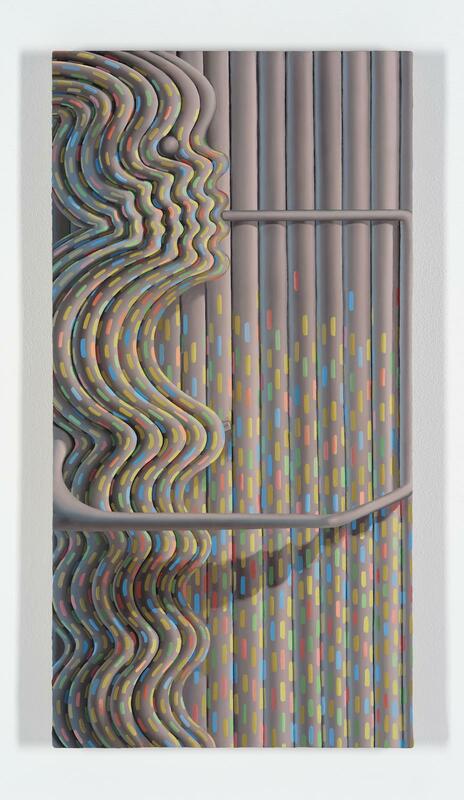 Sascha Braunig, Pillar, 2015, oil on linen over panel, 38 x 15 inches (96.52 x 38.1 cm). Courtesy of the artist and Foxy Production, New York. Image courtesy the artist and Foxy Production, New York. RKS: Has your process for starting a painting changed? SB: I feel like I have gotten better at starting a painting. [gesturing to large wall and table fill with studies] I come up with an idea, make a tiny thumbnail sketch of it then either make a color study, oil on paper sketch, or I’ll go straight to a scale drawing on glassine with ink that is the size of the canvas. I think this is better than just going for it. In the beginning I was just making an object, this physical thing, then immediately painting it. That contributed to the outsider-ish feel of the work from 2010; they are super weird to me. 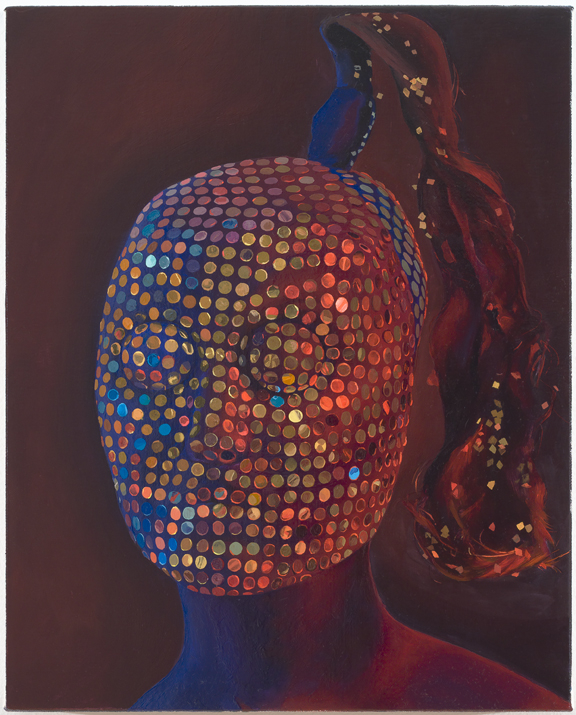 Sascha Braunig, Sequins, 2010, oil on canvas over panel, 20 x 16 in. (51 x 41 cm). Image courtesy the artist and Foxy Production, New York. With those older paintings there was no composition, they were all heads set against a void. I wasn’t really considering the background that much. It is pretty strange how you can be so out of touch with something as basic as that. Those earlier paintings were coming from a different direction though. I had made these masks for videos and I was thinking so much about them as objects, or as sculpture first. Then when I stopped making videos and I didn’t know what to do, I figured I’d just paint this mask over and over. It was very direct, I guess. RKS: So back then it was straightforward, now it is a more convoluted task? SB: Now I’m more of a painter, a straightforward task I arrived at in a very circuitous way. Sascha Braunig, Rebecca, 2015, oil on linen over panel, 36 x 24 in. (91.44 x 60.96 cm). Image courtesy the artist and Foxy Production, New York. RKS: Is this show the path to becoming a painter? SB: Maybe, but I don’t feel like I ever really learned how to paint. I didn’t have many techniques classes. RKS: So how did you learn oil paint? SB: Trial and error. I painted in high school and took a techniques class at Cooper. I looked to my classmates who had gone to art high school and had all this knowledge already. As I got older I went to other people’s studios, I worked for some artists, and looked at what they were doing, though it was never very similar to what I do. At Yale they are really focused on crafting a painting, and I totally avoided that for those two years, I feel like everyone in my class did. [laughs] The whole conversation was getting really formal and making videos was one way to distract people and get them to talk about something else. 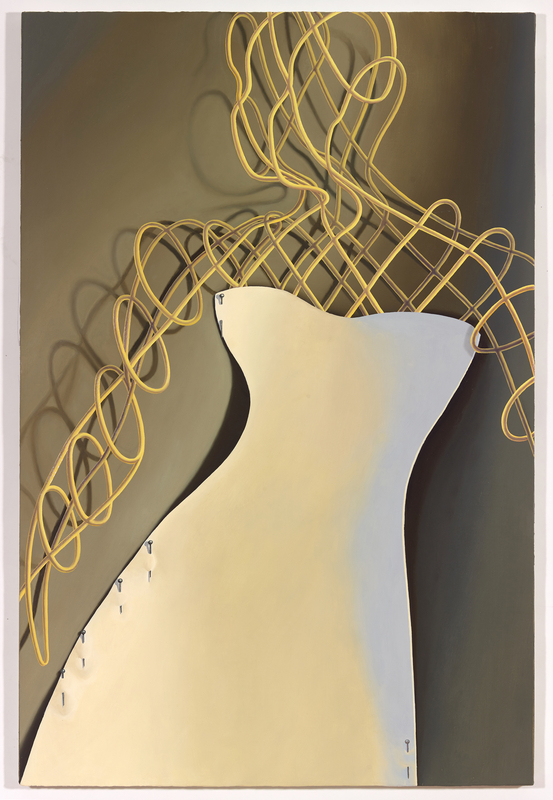 Sascha Braunig, Feeder, 2014, oil on linen over panel, 31 × 16 inches (78.74 × 40.64 cm). Courtesy of the artist and Foxy Production, New York. Image courtesy the artist and Foxy Production, New York. RKS: You know enough now to talk shop with other painters, or are you too idiosyncratic? SB: I do talk shop and that was one reason why I wanted to come back to New York and reestablish connections with artist friends, painter friends. I have been talking with a friend about surfaces a lot. Everyone has their own cockamamie approach to making their own thing now though, and they have developed it in the same way as me which is not necessarily out of formal training. And still, I would like to learn more. RKS: Has how you finish a painting changed? SB: There is a certain level of render or polish that I am going for and I don’t have a very hard time knowing when it’s finished. Most of the changes happen up front as I am mixing colors. I’m more likely to abandon a painting completely than change it a lot at the end. There is a pretty clear vision from the beginning. There is a certain level of fastidiousness that I am going for, and once that’s evident, I’m done. It is an academic or illustrative way of finishing things. I’ll definitely put finishing touches like highlights on and once the highlights are on the work is done, [laughs] it’s very cheesy. RKS: Does your technical skill ever elude your goal? SB: I’m trying to build in discovery, and not just hone this one technique. I’m introducing other elements like larger scale and more body parts, now that I am painting more than a bust. I would like to do some life drawing and explore naturalistic movement – there was no movement in those works from 2010. I want them to look almost sculptural. I want there to be a palpable sense of volume and fleshiness. In order for that to happen, there has to be a certain level of illusion–covering of gestural tracks. But that’s all in the service of what I want the viewer’s experience of the painting to be. 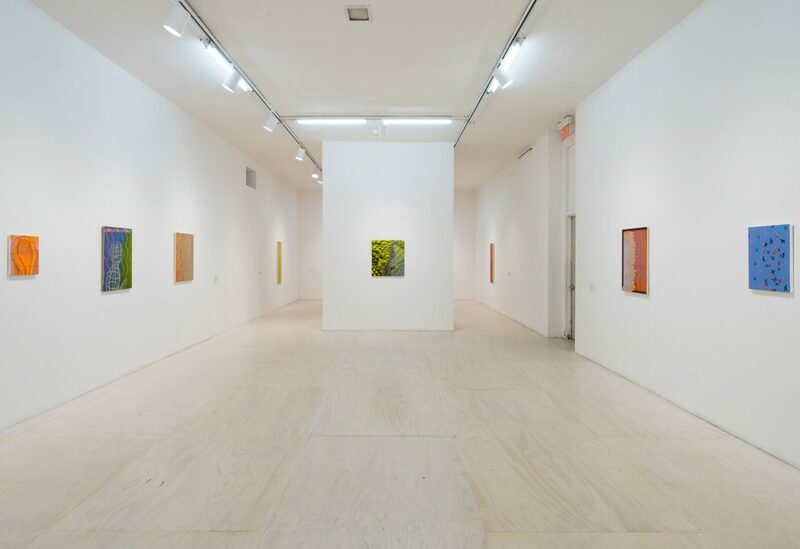 “Sascha Braunig: Shivers,” curated by Peter Eleey. MoMA PS1, Long Island City, Queens, New York. Through March 5, 2017.